Mortgages are the bread and butter of most banks and building societies, but there is certainly nothing simple about these complex loan agreements. To get a customer’s foot on the property ladder, a mortgage advisor needs to complete a staggering 300 steps for a ‘straight-forward’ mortgage application. TSB normally schedules 3-hour appointments for customers applying for a mortgage at one of its branches (that’s almost as long as it takes to watch a Lord of the Rings film). To ensure the process is followed to the letter, and each application ticks all the necessary legislation and compliance boxes, comprehensive mortgage training for staff is essential. TSB wanted to make its Mortgage Sales Training more engaging and more effective so that once its consultants had finished their training, the bank could be confident they had made the grade and could sell mortgages effectively, while staying fully compliant. Unfortunately, TSB’s existing system wasn’t up to date with the latest changes in regulations and compliance, it was as dull as a wet weekend in Whitby and trainees hated using it. The bank approached Day One to see if we could do any better. 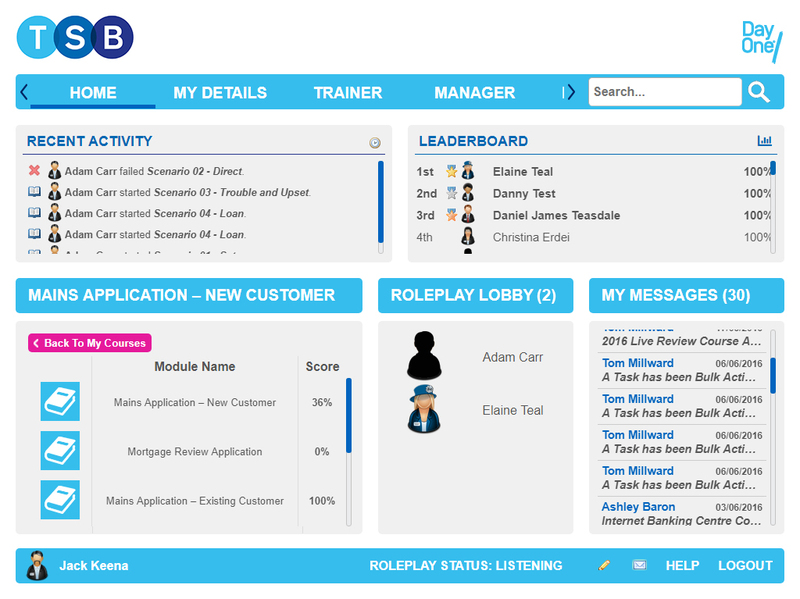 When we started designing the Mortgage Simulator for TSB, we took the elearning mould and broke it several times. We could see that what the client needed hadn’t actually been invented yet, so we needed to get creative to find a software solution that would work for them. The first element of the training suite developed for TSB was an elearning programme that broke the lengthy mortgage application down into smaller, bitesize sections which individuals could practice at their branch. Next, we designed a special simulator which mirrored TSB’s own systems so trainees could apply what they’d learned, with a partner or assessor playing the role of the mortgage-hungry customer. This allows trainees to complete the application process and develop their customer-facing skills at the same time. To make the simulation feel as real as possible, we used our Dynamic Data™ to provide randomly generated customer details, and as a finishing touch we made it easy for delegates to print-out the paper documents created for each customer at key points in the process. These paper documents are an important element of the mortgage application, and the advisor must talk the customer through them to check facts, ensure compliance and complete the application process. All those details which flummox the best of us when we are applying for a mortgage! So that TSB trainers could see at a glance how their learners were doing, the simulation also scores trainees’ actions, plus assessors can add their observed scores too, so it’s all in one place. Nice and tidy, just how we like it. TSB was so happy with the new mortgage sales training system that it was rolled out to every one of its 600 branches in 2016, and is now an essential part of the bank’s blended training mix, helping to make life a doddle when it comes to teaching and upskilling their staff. See how we used simulations to improve Training in Legacy Desktop Systems at Co-op.